Weight gain in pregnancy can influence and affect the current and future health of the pregnant mother and her baby. Research shows that the number of women who gain weight during pregnancy is ever increasing, causing obesity among women during pregnancy or even before conception as a result of unhealthy eating habits. There is a relationship between an increase in birth weight with an increase in gestation weight and a decrease in birth weight and a reduction in gestation weight. Pregnant women need to maintain healthy weights in order to give birth to healthy infants. Maintaining proper and healthy weight will result to children who are neither underweight nor overweight. The Institute of Medicine (IOM) has a particular pregnancy body mass index that act as guide for pregnant women with all weight types irrespective of age, parity, smoking history, race or creed. There are various causes of weight gain during pregnancy. Hormonal change in pregnant women can contribute to an increase in weight among women. Pregnancy sometimes causes anxiety among women. Those who previously had trouble maintain the prefect weight may find it hard adapting to the weight gain leading to an extra increase in pounds. Lack of exercise among pregnant women can lead to weight gain. Exercise does not mean hitting the gym. You can do simple body exercises like yoga. Weight gain during pregnancy—in the right amount—is necessary in order to give birth to a healthy baby. The proper amount of weight depends primarily on your build before pregnancy. Women sometimes justify weight gain in pregnancy by claiming they are eating for two. However, having a healthy lifestyle makes it easy for you to manage pregnancy weight gain and your baby’s health. It also makes it easy to manage your weight before and after giving birth. 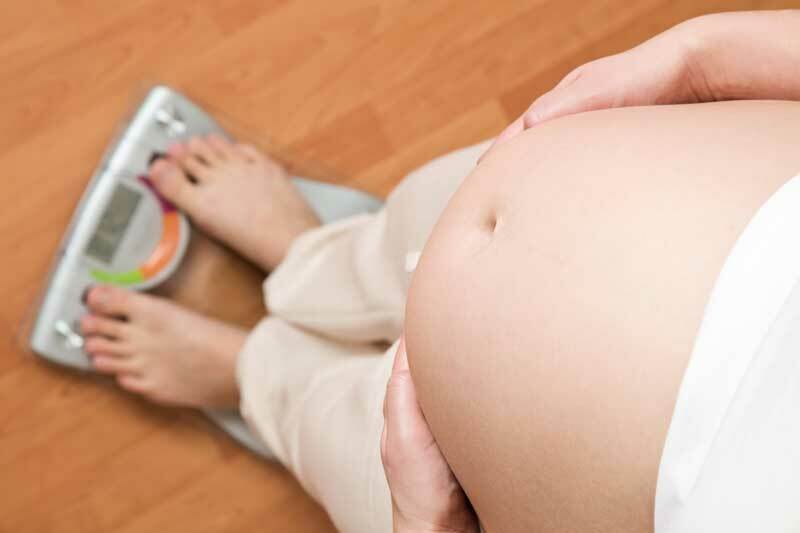 Normal weight in pregnant women is having a BMI of 18.5-24.9 and recommended weight gain in women with normal weight is between 25-35 pounds (11kg-16kg). Women who are under weight prior to their pregnancy are encouraged to pack on a few more pounds to ensure a healthy baby. The recommended weight gain for slim women is 28-39 pounds (13-18 kg). Overweight women are recommended by IOM to gain weight of 13-26 pounds (6-12kg). However, study shows that even if the women did not gain the recommended weight, there was no danger posed to the fetus. Consequently, there is no pressing need for such women to gain that much weight. IOM defines obesity as having a BMI of 30 or greater. It recommends obese women to gain between 11-19 pounds (5-9kg). There are various classes of obesity and statistics are not clear on the various weight people should gain but gives a blanket weight range. As per the studies and IOM, the perfect way to keep a healthy pregnancy weight is by using your BMI to know how much to gain and how much to lose to remain at the recommended weight bracket. BMI does not differentiate between different age groups and people of all ages are factored in. Increase in weight among pregnancy women can cause pregnancy complications leading to gestational diabetes, preeclampsia and cesarean delivery. It is therefore recommended that pregnant women to consult the help of nutritionists to assist them in healthy eating habits. Other complications related to weight gain includes hypertension. Gestation weight increase is also problematic when trying to shed it after pregnancy. Over emphasis on the modern woman having a nice model-like body problem makes it hard for the women to live with themselves after pregnancy weight gain. Eating healthy makes it easy to lose the extra weight after pregnancy. After pregnancy, many women don’t like how they look. The increase in weight may make them resort to weight loss tactics like not eating well. This may affect their health and that of a breastfeeding baby negatively. Therefore, it is important for you to consult a nutritionist and a personal trainer to get help on how to lose weight in a healthy manner. Previous Post: « Pregnancy Oral Health: Is Fluoride Safe?